Tis a gift to be simple, says the old Shaker song, and this gift to your birds couldn t be more beautifully simple, or simply beautiful. The quality of design and purpose shines through in uncluttered lines and a bright white exterior beneath the burnished A-line copper roof. Craftsmanship that s a sight to behold and that will hold your birds in comfort for years. 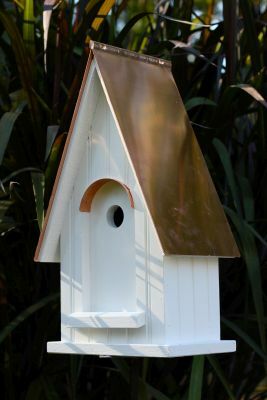 Uncluttered lines and a bright white exterior makes this USA made birdhouse a sight to behold. Burnished A line copper roof tops off the cypress wood house that is impervious to insects and wood rot. 1 1/2 hole size. Comes with a cleanout, ventilation and drainage built in.